TEXO is an expert organization helping its members in professional matters and taking care of the relationships within textile, culture and society. TEXO organizes textile art and textile design exhibitions as well as seminars, workshops and competitions. 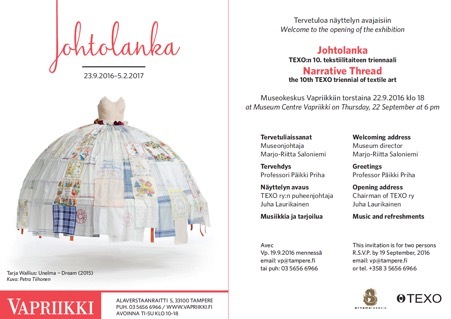 JOHTOLANKA – NARRATIVE THREAD The 10th textile art Triennale of TEXO 23.9.2016 – 05.02.2017 - presented new Finnish textile art, and artists' narratives in new ways and means of expression. 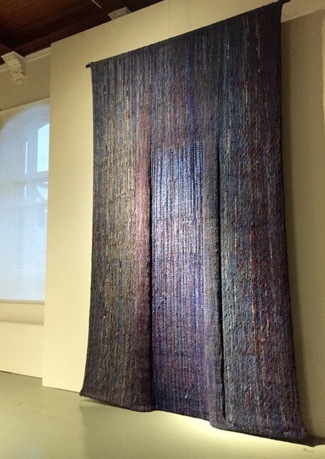 The exhibition was the main event of the 60-year-old Finnish Association of Textile Artists TEXO and included also workshops open for the public. During the opening days TEXO had a meeting with NTA representatives for the plans of the 2018 NTA Conference in Hämeenlinna / Tavastehus which is planned to be the venue of the next NTA meeting in Finland. 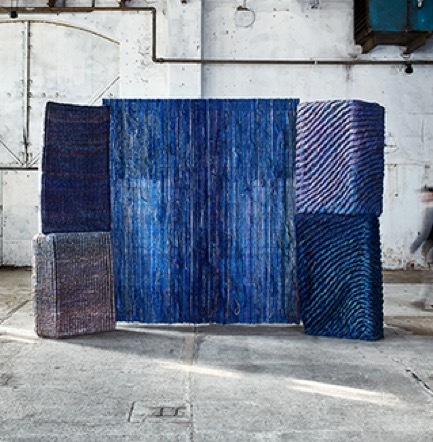 The Finnish Association of Textile Artist TEXO nominated in it’s meeting the following fibre-artists as national representatives from Finland to the 15th International Triennal of Tapestry, Lodz 2016. 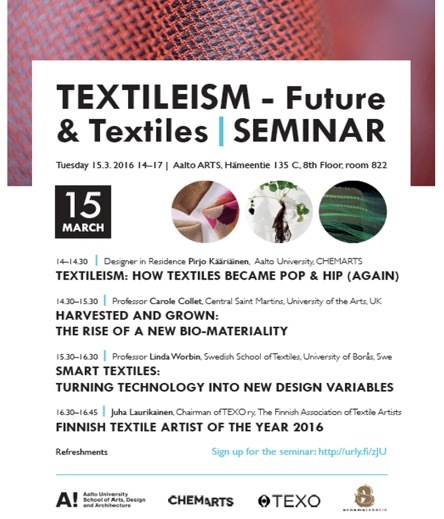 TEXO nominates annually the textile artist of the year and 2016 this honor was given to Professor Pirjo Kääriäinen from the University of Aalto in the TEXTILEISM Future & Textiles seminar organized by Texo and the Aalto University. The Design Museum presented an exhibition of textile art by the Finnish textile designer and pioneer of fibre art Kirsti Rantanen (born 1930), who has taught a whole generation of textile designers and artists, and her own work has been of trailblazing importance. In the 1970s, her expression moved from two-dimensional figurative wall hangings towards three-dimensional sculptural work which grew in the 1980s into monumental entities and installation. In the 1980s, Rantanen was involved in raising the status of textile art, dominated by women, to an equal standing alongside other genres. She has set an example to younger generations in many respects. Natural materials.